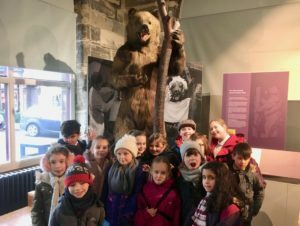 How do you introduce fifty 8-9 year olds to the history of Warwick in less than 90 minutes? 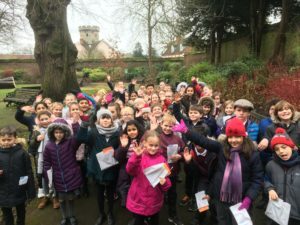 At the request of teachers at All Saints Junior School, the Unlocking Warwick volunteers took up the challenge on 5th February and organised a walk round the centre of Warwick for the school’s two year-4 classes. The children gathered at the Court House and were divided into three groups to be taken round in different directions. The brief history lesson included the founding of the town by the ‘Lady of the Mercians’ Aethelflaeda, during the battles for possession of central England between the Anglo-Saxons and the Danes, the Norman Invasion and the building of the castle and the town walls, and the Earls of Warwick. The children were particularly interested to hear about the dramatic Great Fire of Warwick in 1694, and the rebuilding of the town centre in brick and stone. They saw the tombs of the Beauchamp family Earls in St. Mary’s Church and heard how Robert Dudley, the Earl of Leicester, unsuccessfully wooed Queen Elizabeth. And they visited the Lord Leycester Hospital he founded as a retirement home for old soldiers. The tour round finished at the Jury Street Court House where there was a collective ‘Wow’ as the children entered the superb Regency ballroom, and they were given some small goody-bags in the Visitor Information Centre. Back at school they will be doing a project about what they learned during their brief introduction to the history of the county town.